In this post I will explain the new functionality “Progress Workflow When Hold Released” offered by Oracle in R121.1.1. Navigate ACTION > Progress Order. This is very time consuming if there are lot of order that are either on Header or Lines Hold.User need to progress each and every Header or Line Manually. Please Note that Hold in Order Header /Line is nothing but a workflow BLOCK activity. In R12.1.1 Oracle has introduced a new feature – with this feature whenever a workflow driven hold is released, system will progress the workflow too (based on the setup). 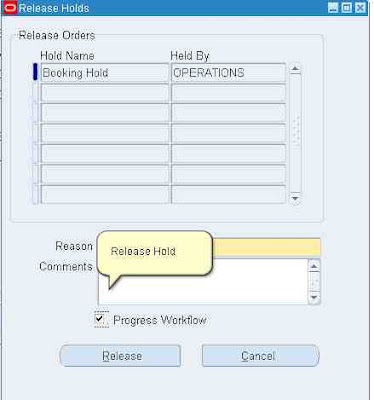 In R12.1.1 Oracle has provided a new check box in the Hold UI.This new check box is “Progress Workflow on Release “. Please Note that this Check box is enable only for only those Holds that are based on Workflow based activity. For any NON-workflow based Hold this check box will not be enabled. So whenever a User Release a Workflow based Hold and if check box “Progress Workflow on Release “ is CHECKED for that Hold the workflow Progress. BUT at the same time oracle has provided a feature to Override this Setup , that means even this check box “Progress workflow “ is checked for a Hold , user still has ability to override the progressing of the workflow. Workflow will not progress. Hence progressing if the workflow in Release of Hold can be the controlled till the Hold Transaction is not finally completed. I have a question, how would I know wether user has un checked the check box at the time of releasing HOLD. Will this information store anywhere in the data base tables ?